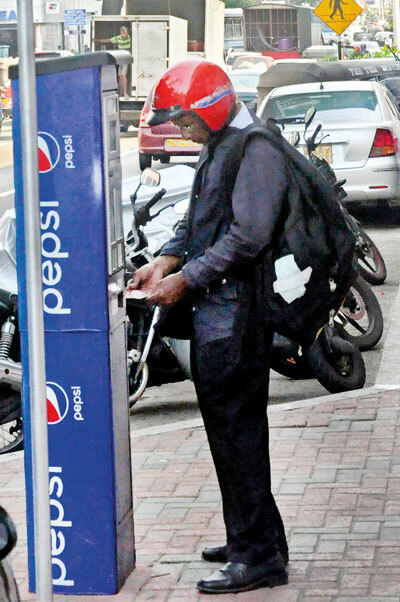 Motorists are side-stepping Colombo’s new parking meters because they can’t operate the machines, haven’t learned to adjust to metered time or are happily evading fees because the system is not policed – but an app will soon be after them. There are 100 parking ticket machines each covering around 15-20 vehicle spaces along the Galle Road, Duplication Road, connecting by-roads and Galle Face Green. Motorists pay Rs. 10-50 per hour according to the type of vehicle while school vans and buses can make a monthly payment of Rs. 600-1000. Non-payment or overstaying will be punished by a fine equivalent to double the parking fee. For example, a car parked without payment in a Rs. 30 per-hour space will incur a charge of Rs. 60 per hour. If the owner overstays or drives off without paying, a fee of Rs. 1080 a day will be charged for the first 14 days of non-payment. Thereafter a monthly fee of Rs. 15,000 will apply. Thereafter, a monthly sum worth 13 times the second day’s payments will be charged every month for three months and if the fine is still not paid a court summons will be issued. This fee structure also applies to motorbikes, three-wheelers, light vehicles and heavy vehicles that are illegally parked. However, school vans and buses face smaller fines. After three consecutive days of being illegally parked, the vehicle will be clamped. Until all late charges are paid the vehicle is confiscated by an authorised agent of the Municipal Commissioner. The municipality is absolved from liability if the vehicle is damaged during this process. The meterised parking system is a flop, said trishaw driver A.M. Wickrema, who works on Duplication Road. He sees that most people come to the machine but leave without operating the meter, sometimes because they do not know how to operate it. “Previously there was a parking enforcement officer who asked people to take a ticket and told them they would be fined if they did not make the due payment,” he said. Now, because there was no officer present, people opted not to pay money into the ticketing machine. There were no visible signs or instruction placards for the meters, he said. “For over 27 years I have been a driver. This is the most confusing method of parking regulations. People just can’t plan the time that they are going to park their vehicle: they park until they finish their chores – they can’t stop those halfway to pay money into the machine,” he said. Another problem with the meters is that they only accept notes, said a city worker, Pradeep Prasanna, who has to use a meter every day for his work. “I park for an hour and the ticket costs around Rs. 30 but the machine does not accept 10-rupee coins so I’m forced to pay Rs. 40,” he said. The extra money gets him 20 minutes more parking but he does not require it, so he wastes Rs. 10 every day. Although people used to criticise corrupt parking wardens for not returning change the machines had the same fault, he said. “It is good to have an advanced and organised parking system to prevent people taking up parking spaces for too long but the system needs to be improved,” Mr. Prasanna said. Some companies have been able to secure special arrangements for parking. K.G. Karunadasa, a security officer working for a private company near Alfred House Avenue, said the company’s vehicles were parked at the roadside after obtaining special permission through a monthly payment to the Colombo Municipal Council (CMC). Car owner M.G.U.S. Wickremaratne said motorists were not told which private company collected fines or where this entity was located. He said he bought a parking card from a phone company for Rs.200 but did not know to reload the card with cash for future use. 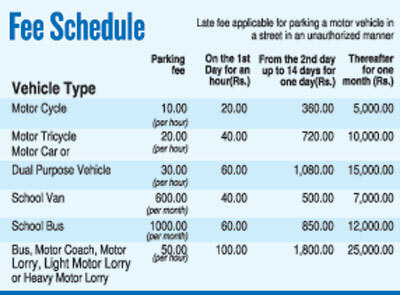 CMC Engineer Manjula Kularatne, who is in charge of the parking programme, said the new system was adopted to ease traffic and was the first step towards modernising the city with a transparent parking ticket programme. He said the traffic warden system was disorganised and realised little revenue due to lack of fee planning and corruption. “The manual fee collection was not welcomed by the public as the wardens were harsh on the people as well as collecting fees on their own terms,” he said. The pilot project of 100 ticketing machines, to be tested over an eight-year period on Galle Road and Duplication Road, is similar to systems adopted in countries such as America, and India, he added. “One machine cost Rs 1.5 million, therefore the estimated cost of the 100 machines is be around Rs 250-350 million,” he said. The private-public partnership project is run by the CMC and Tenaga Pvt, which won the tender to install the machines. Tenaga takes 60 per cent of the profits while the CMC gets 40 per cent. Mr. Kularatne said there was a mobile app to pay meter fees but it could not be used to pay parking fines. He acknowledged the difficulty of finding Rs. 10 notes but said people could use Rs. 20 notes and qualify for 20 additional minutes of parking time. “The machines are not programmed to provide change but people can pay the parking fee amount through the Tenaga Park application via their smartphone,” he said. He confirmed that a touch card issued by Dialog could also be used in the meters but that the card had not yet been approved by the Central Bank. Tenaga Director Operations Rehab Ariff said Tenaga will monitor parking by using vehicles fitted with cameras and deploying inspection officials using a smartphone app to scan number plates and detect vehicles that have been parked without fee payment or where owners have exceeded parking time. The app scans the vehicle from all four sides. Mr. Ariff said fines could be paid at the company’s office at Maya Avenue in Colombo 6 and that the app was being redeveloped so that it could be used to pay parking fines through credit and debit cards.